The Mobile World Congress saw Nokia release not two, not four by five new S60 devices. We have all seen pictures, videos and basic specifications of the N86, E55, E75, 6710 Navigator and the 6720 Classic but the real geeks and S60 enthusiasts are always interested in the insides of the device, what processor the phone runs, supported Bluetooth profiles and so on. 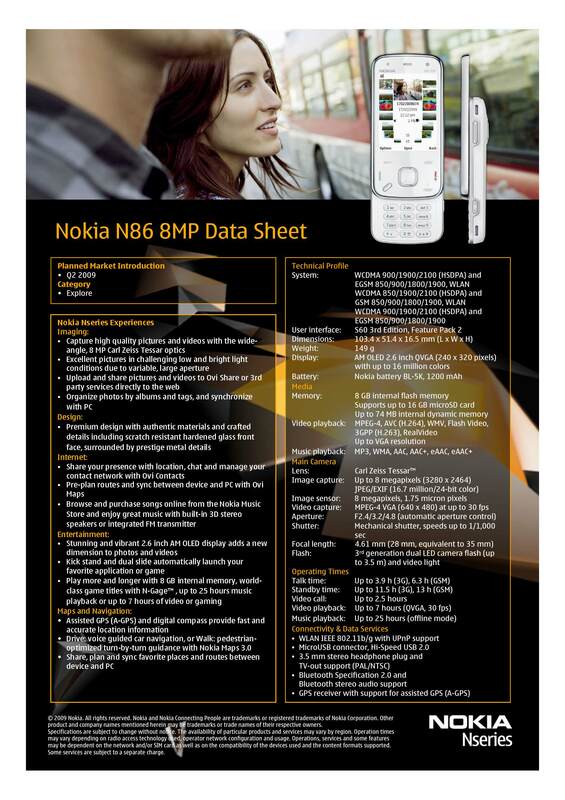 For those of you Forum Nokia has published the technical specifications of all the above mentioned devices. The interesting thing to note here is that Nokia has slowly moved away from the standard 369MHz processors to the 600 MHZ ones on the E55, 6710 and 6720 with the exception of the E75 which still runs on 369MHz. At the MWC the GSMA has announced a plan for major phone manufacturers to produce one standard microUSB charger that would work across all handset brands. The plan has the blessings of major manufacturers including Nokia, Samsung, Sony Ericsson, Motorola & LG amongst others. Recent devices from Nokia such as the N97, N85 and the just announced N86 already support microUSB charging and the plan is to make most devices support this standard by 2012. After the Nokia E75, it is now time of the Nokia N86 to be demoed in video. The N86 is Nokia’s latest imaging flagship that boasts of a 8MP camera and a 3rd generation dual LED flash. The USP of the camera is the presence of a wide-angle Carl Zeiss Tessar lens for panoramic pictures, shorter latencies and variable aperture for super sharp photos in challenging bright and low light conditions. The N86 was officially announced today on the second day of the MWC. Full specifications here. What follows is a set of four videos based around the E75 that covers the E75 in detail. Right from the story behind it to the unboxing, to a brief play with the device and finally a close look at its exteriors. Perfect, if you are not in the mood to read about the E75. The 28mm wide angle lens and the F2.4 aperture should make for some great low light shots, Nokia is calling the flash – the 3rd Generation of dual-LED’s with a range of 3.5 meters, so can it be something better than what we’ve seen on the N96/N85? I sure hope so. If the flash can be 80% of what Xenon is, I be happy with the device.